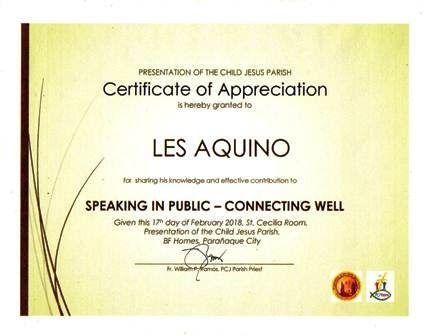 At the culmination of my HPL's Public Speaking Workshops for the PCJ Parish Church Commission on Youth, we, the facilitators, received this nice certificate from the PCJ Parish Coordinator and signed by the Parish Priest. Listed below are the milestones leading to the Public Speaking Workshops that were conducted for the Presentation of Child Jesus (PCJ) Parish - Commission on Youth as my High Performance Leadership (HPL) Project. Apart from these milestones were the other activities that occurred prior to the workshops. These activities include communication via Facebook messages, text messages, email and informal meetings. They are too numerous and detailed to include in this post. DD Jayson contacts DD Jeffrey and seeks Division H volunteers to assist the Youth Ministry of the Presentation of the Child Jesus (PCJ) Parish in BF Homes at Parañaque City. PCJ Parish Coordinator Minnie contacts Club President Leah. PDD Raul confirms with Leah that the project would qualify as a High Performance Leadership (HPL) Project. Les accepts the project for HPL and is advised by Leah to select the Guidance Committee members. Les contacts Minnie and provides toastmasters' available dates, citing possible schedule conflicts like the upcoming Club Officers' Training 2, an upcoming Garage Sale, and Regular Club Meetings. Minnie sets Feb.17 as tentative date for workshops. Les recruits Raul as the 1st Guidance Committee member who will help facilitate the workshops as Evaluator and Presenter. Les recruits Minnie as the 2nd Guidance Committee member who will take care of logistics (venue, multi-media projector, laptop), identify the participants, and identify the training needs of participants. Les recruits Ching as the 3rd Guidance Committee member who will help facilitate the workshops in the demo portions of Impromptu Speaking (table topics) and Prepared Speeches. Les recruits Russell as the 4th Guidance Committee member who will provide ideas for table topics and energizer activities for the participants. HPL Project Review Meeting with Guidance Committee toastmasters-members, Ching and Russell, is held at Mystic Brew Restaurant. Raul, the other toastmaster-member, begs off from project review meeting. Minnie confirms to Les that Feb.17 as a workable date. Les asks Ching to draft an Evaluation Form to be filled-up by the participants at the end of the workshops. This is one of the items Ching suggested at the Project Review meeting. Les asks Russell to suggest energizer activities and 2 sets of age-appropriate table topics: one for ages 14-17, and another for ages 18-22. Ching confirms her availability on Feb.17 and promises to draft and submit Evaluation Form on Feb.03. Russell submits lists for energizer activities and table topics. Les sends out minutes of the Jan.27 Project Review Meeting and a General Program Outline to the facilitators. Raul promises a proposed program and suggests getting table topics and a volunteer timer from participants. Les follows-up demographics from Minnie and requests to extend the workshops duration to 4 hours. Russell informs of his unavailability available on Feb.17 due to work and graduate studies commitments. Ching gives Les a printout of her proposed Evaluation Form to be used as an assessment tool after the workshops. Minnie gives updates on workshops date. Still getting registrants. Les drafts and sends a Revised Program Flow to the team and suggests changes to the Evaluation Form. Raul asks for the workshops' TOD and Topicsmaster. Suggests dividing Table Topics with Ching handling SMG and PPF patterns and Raul for PROBE and PREP patterns. Les agrees to be TOD and Topicsmaster. Les asks Ching to prepare an Icebreaker speech as a demo for Prepared Speeches. Minnie confirms final date, venue, pax and demographics of participants. The number of participants is slightly reduced due to an unexpected parish event (Basic Ecclesial Communities Meeting) that coincides with the scheduled workshop date. Ching confirms to being the Timer and to bring prizes for Best Table Topics Respondents and Best Prepared Speakers. Les sends the Final Program Flow with Tasks (ProgramFlow.doc) to Minnie. Minnie requests to include a background and introduction to Toastmasters. Les prepares sample table topics as a contingency plan. Writes down all topics suggested by Russell on slips of paper for drawing. Les prepares a few presentation slides for contingency. Raul informs that he cannot make it due to some unavoidable circumstances. Ching collects the evaluation forms filled-up by the participants. She will summarize the results of the evaluation for assessment purposes. Even if we, the facilitators, were not complete at the workshops as shown on February 17, we were able to recover well and made the training session a resounding success. Note: The continuation and final phases of the High Performance Leadership Project may be found in the Post-Workshop HPL Program Milestones.